Big History allows students to gain knowledge, extrapolate on their thoughts, and discuss the larger implications of their learning on the world of today and the future. 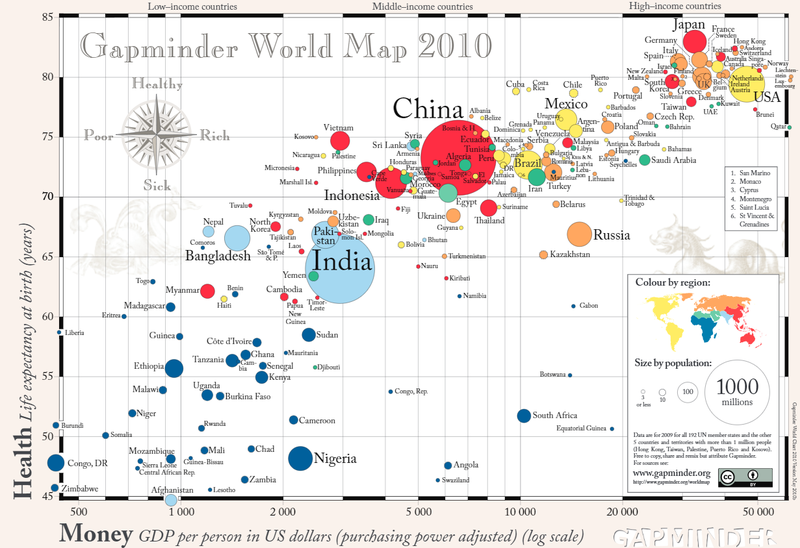 The Gapminder website (http://www.gapminder.org/) has invaluable information for students to dig through and begin to draw connections between population growth, child mortality rates, average life expectancy, and so on. Some of the data that is available pre-dates WWI. In my classroom, we use this data to make predictions about the future. We link the information to major world events. We look at specific dates and make predictions, based on prior knowledge, about what life was like in a variety of locations. Most importantly, we look at how the world has changed since the end of WWII and how much of an impact increased globalization has had on the wealth and health of the world. The Gapminder project allows students, in a manageable way, to see how the world has expanded and changed over the decades. Are humans impacting the environment, and the world, at a faster more menacing rate than before? What will the world look like in the future if we continue on our current trajectory? How can we sustainably support individuals that are concerned with providing their families with food and shoes in less affluent areas of the world? Overall, how can we make changes to support our projected population increase and advanced technological integration? The world of 1900 was vastly different from the world of today. Unit 9, the Modern Revolution, allows students, while investigating the reasons for those changes in depth, to continue to grow in their theories and develop notions about what the world will be like as they enter into adulthood. Hans Rosling states that he is “not an optimist, neither is [he] a pessimist, [he] is a very serious possibilist.” Through the analysis of Gapminder data and the inclusion of lessons throughout Unit 9, the students at Novi High School are learning about the development of the modern world, while investigating all of the possibilities the world has to offer going forward. In an increasingly interconnected time, we must be knowledgeable of the plight of others in order to successfully work toward world-wide advancement. Visit the Big History Project website to register for a free teacher account and access all of our activities and lesson plans.